In the last few episodes of The People v. O.J. Simpson: American Crime Story have made anything clear, it's that O.J. Simpson's so-called Dream Team of defense attorneys had much more conflict than that name would lead you to believe, despite the trial ending with Simpson being found not guilty. 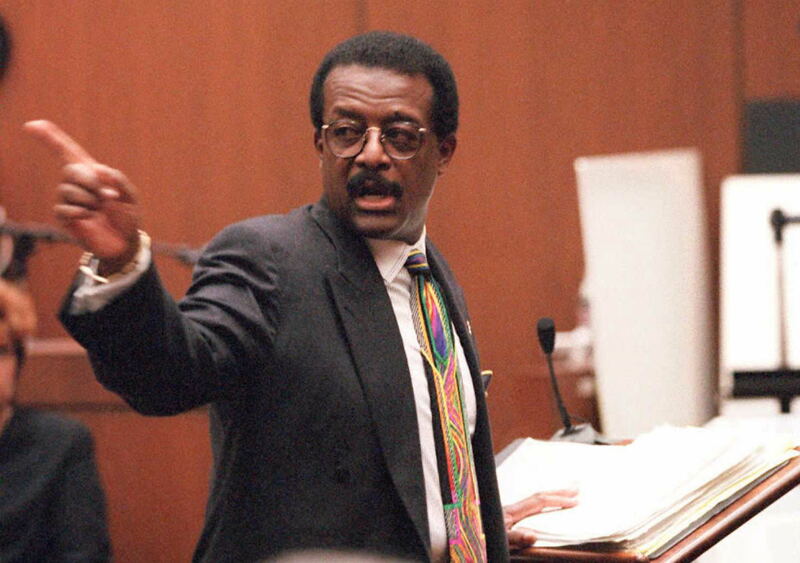 If you read and listen to real Johnnie Cochran quotes about Robert Shapiro, it quickly becomes obvious that the contentious relationship between the two lead attorneys portrayed in the FX series has its basis in truth. While Shapiro was Simpson's lead attorney first, with Cochran taking a larger role later on, it was arguably Cochran who left the most lasting impression. Shapiro had some choice quotes about his co-council as well, telling Barbara Walters after the case concluded that he would never work with Cochran again. Shapiro also told Walters that because of Cochran, "not only did we play the race card, we dealt it from the bottom of the deck," insulting both Cochran's skills and his judgement in how to craft a legal argument. Cochran's words on Shapiro were a little more conciliatory, but it's clear from these soundbites that even on such a monumental case, there wasn't room for two personalities this big. Cochran responded to Shapiro's comments in a KNBC-TV interview, saying that Shapiro had some "demons that need to be exorcised," and speculating that Shapiro was "somewhere at home, sulking and feeling bad." In his book, A Lawyer's Life , Cochran said that he and Shapiro had issues from the start because he believes Shapiro thought Simpson was guilty. "Admittedly, from the beginning there were some bad feelings between myself and Bob Shapiro, who made it clear he believed our client was involved in the murders, and unfortunately that situation never improved," Cochran wrote. In 1996, Shapiro said he never had an opinion on Simpson being guilty or innocent, with J Weekly quoting Shapiro as saying, "I wasn't there, you weren't there and I don't know if I ever allowed myself the luxury of coming to my own conclusion." Cochran also wrote about working with Shapiro during jury selection in A Lawyer's Life, saying, "Robert Shapiro was standing on the other side of Simpson. 'It's going to be bad news,' he said to him. 'Shut up,' I snapped at Shapiro." And in a quote from Journey to Justice , another book co-authored by Cochran, he said, "the satisfaction I felt ... could not eclipse my growing disillusionment with Bob Shapiro." Clearly, working together proved difficult for these two. Cochran described how Shapiro conceded lead attorney to him during an appearance on Charlie Rose, saying "It wasn't a voluntary passing ... O.J. Simpson said 'I'm making a change, I want someone else to head this team.'" Cochran also told KNBC-TV that he "did not realize the damage it would do to [Shapiro's] ego not to be lead attorney." While a guest on Larry King Live in 1995, Cochran clarified how race played a role in the case, crediting Shapiro for some of the strategies he later denigrated. "The one problem that I would like for him to be aware of ... Bob Shapiro had started talking about Fuhrman planting the glove long before I ever came on the case. And, in fact, we never played any race card. What we did was pursue the credibility card." This refers to the defense team's suggestion that Detective Mark Fuhrman had planted evidence to frame Simpson. When asked whether he framed Simpson during the trial, Fuhrman invoked the fifth amendment, and in his 1997 book Murder in Brentwood, Fuhrman wrote, "I will not apologize for is my policework on the Simpson case. I did a good job; I did nothing wrong." In his Charlie Rose appearance, Cochran does credit Shapiro by saying, "Bob Shapiro did a good job putting this team together," and calling him a "good team player." While on CNN, Cochran added this disclaimer to his comments about the race card. "I enjoyed working with him on this thing, I thought that he showed a lot of character." He also told CBS, "I like Bob Shapiro a lot but I don't think anybody on this team is in any great hurry to work with him again," as quoted by USA Today. Even though it seems Cochran retained some personal affection for Shapiro, their working relationship was not an easy one — and that's why the two characters on The People v. O.J. Simpson are constantly at odds.